Poor little Jelly Belly was turned in as a stray at a high kill shelter. She was in terrible shape and no one wanted this poor little girl. We rescued her and now she is safe and happy. We have her on a good diet and she is doing great. Jelly Belly is about 6 years old, and weighs 48 pounds. She is good with most other dogs but likes to be in charge, so she would be best as an only dog or someone with bully breed experience. She likes to chase cats so a home without cats would be best. She can be shy at times when meeting new people but once she warms up, she will sit on your lap for pets and love. 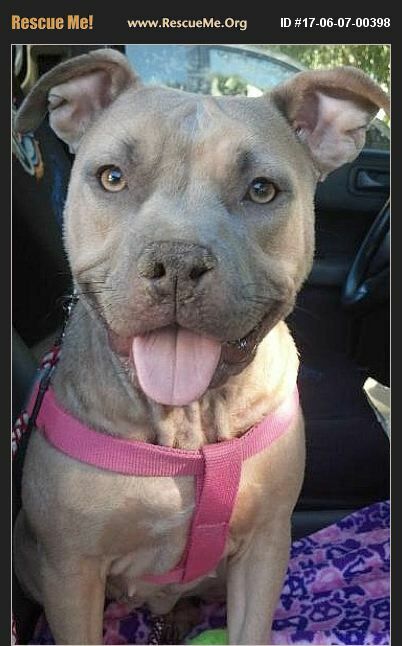 She is an active dog and will need an owner who has the time to train and exercise her and who will be the pack leader. Jelly Belly is looking for someone who will love her forever.